The Outback is the remote arid areas of Australia, although the term colloquially can refer to any lands outside of the main urban areas. 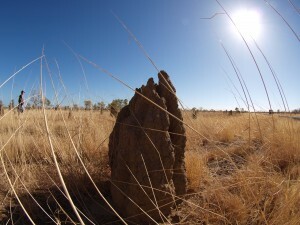 The term “the outback” is generally used to refer to locations that are comparatively more remote than those areas deemed “the bush”. The outback is home to the Australian feral camel, donkey and dingo. The Dingo Fence was built to restrict dingo movements into agricultural areas towards the south east of the continent. The marginally fertile parts are primarily utilised as rangelands and have been traditionally used for sheep or cattle grazing, on cattle stations which are leased from the Federal Government. While small areas of the outback consist of clay soils the majority has exceedingly infertile palaeosols. Riversleigh, in Queensland, is one of Australia’s most renowned fossil sites and was recorded as a World Heritage site in 1994. The 100 km2 (39 sq mi) area contains fossil remains of ancient mammals, birds and reptiles of Oligocene and Miocene age.